Help a paranoid wood elf with his conspiracy woes. Glarthir regards Bernadette Peneles with suspicion. Glarthir will approach you on the street and tell you to meet him behind the Great Chapel of Julianos at midnight. Follow through with the meeting and he'll share his thoughts about a conspiracy against him. Glarthir identifies a conspirator and asks you to observe their movements for a day. Optional: Follow the person that Glarthir has identified. If you report that they were not acting suspiciously, he'll give you 150 gold. If you report that the person was indeed spying on him, he'll give you 200 gold. Repeat the process for two other potential conspirators. Kill the intended targets and receive 1000 gold from Glarthir. Report Glarthir to the authorities and receive 1 Fame. (If you accused Davide Surilie), inform him or his brother that Glarthir wants them dead and they will kill him themselves. Enter Skingrad and you will meet a Wood Elf named Glarthir, who behaves in a disturbed way. He will stop you in the street and ask you to meet him behind the Great Chapel of Julianos at midnight. The Great Chapel is contained within the south walls of Skingrad. Once there, he will explain to you that he believes there is a conspiracy against him. If you don't meet with him immediately, he will keep showing up each night around midnight until you talk to him there. He goes on to identify Bernadette Peneles, who lives right across from his house, as someone who has been assigned to spy on his movements. Glarthir asks you to be outside his house the next morning at 6am and to monitor Bernadette's actions, warning you to not let yourself be seen by her. Glarthir then sets up another meeting with you at midnight the following day and warns you not to make any contact with him in public. If you refuse the initial request to help with Bernadette, the quest will show completed, and he will try to work out problems on his own. He will go to his house and, after about an hour, come out with his battle axe and enter Bernadette's house, and attack her. She may run outside, and the guards will kill him. Alternatively, he may kill her inside her house or the church and exit after about an hour. Follow him and the next guard to meet him will kill him. In either case, you can search his corpse to find his house key, then enter his house to take the 800 gold in the wastebasket. If you talk to a guard after this, you can ask him to arrest Glarthir (however, they can't do anything until you receive his death note later). You can also tell him about Glarthir's suspicions; the guard will say he's "getting worse" and asks you to keep an eye on him. Apparently, his shaky mental condition is well known in the city, and many citizens will comment on how he's "having one of his bad spells" lately. You will eventually be approached by Dion, the guard captain, about your interest in Glarthir. He will warn you not to get involved with him and to report any strange requests to the guards. Meet with Glarthir behind the chapel at midnight. Again, you can wait days or weeks before meeting with him. He will ask you if Bernadette is actually following him. Whether you tell him the truth or lie you will get 150 gold as a reward. If you say that you don't have enough information, he will go back to waiting and showing up behind the chapel each night until you are ready to continue. Glarthir will then ask you to follow Toutius Sextius, whom he also suspects. Again, follow Toutius around if you want to assuage your conscience or curiosity, although it is not required to complete the quest. Report back to Glarthir at midnight, and tell him what you want. If you cleared Bernadette and again clear Toutius, Glarthir will find it hard to believe that neither one is in a conspiracy against him, but he will still reward you with an additional payment of 150 gold. If however you accused Bernadette and again accuse Toutius, Glarthir will be overjoyed that he was right and will reward you with an additional payment of 200 gold. He will now ask you to follow Davide Surilie, whom he thinks is the ringleader in the conspiracy against him. Davide is one of the two brothers who own the Surilie vineyard to the west of town. Again, follow him or not. When you report back to Glarthir at midnight there are two options. If you told him that none of the three are following him, Glarthir will attack you. (Note:Glarthir's iron battle axe is located on the third floor of his house. If you steal this, and then inform him (all three times) that his suspects are not spying on him, he will attack you but will be unarmed.) Otherwise he will give you another payment of 150 gold (if you cleared the other two suspects) or 200 gold (if you accused at least one of the other two suspects) for following Davide, then hand you a note and offer you 1000 gold to kill each of the people you told him were following him. If you refuse to kill them, Glarthir will go and try to kill them himself (same as if you declined him at the beginning of the quest). If you choose to kill them, you will only need to kill the ones you picked as following Glarthir. His note tells you whom to kill, and, if you picked Davide, it will tell you to kill him first, however the order doesn't matter. Davide is fairly easy to kill. He should be asleep in his house right about the time you finish talking to Glarthir. With some sneaking and lock-picking you should be able to kill him in his bed without his brother noticing. The lock on the Surilie brother's balcony is average, making it an easier point of entry. He is sleeping in his house, and as he wakes up from your first strike, he shouts out, landing you a bounty of 40 gold. Guards are on patrol nearby and you'll probably get arrested right outside the door. Toutius likes to hang around alone in a field outside of town during the day. That may be an easier way to bump him off without nearby guards. Bernadette's killing is also rather simple. With only 90 health, a sneak attack while she is sleeping followed by a reasonably powerful Destruction spell should finish her off. Once you have killed everyone you are supposed to, return to the meeting place at midnight to collect your reward (1000 gold) from a very relieved Glarthir. To take the middle road, tell Glarthir that any one of the suspects is watching him. When he hands you the note, take it to a guard. Hand him the note, and follow him to watch him kill Glarthir. Grab his house key and get the 800 gold from the wastebasket. This way you get no bounty, almost as much gold, and 1 fame point. Alternatively, you can pickpocket Glarthir for his house key, steal everything in his house, kill Davide and collect the final 1000 gold as well. If you show Bernadette or Toutius the note telling you to kill them, they will simply ask you to inform the guards. However, if you accuse Davide and show him or Gaston the note, they will attack Glarthir themselves. If any of the targets (Bernadette Peneles, Toutius Sextius, or Davide Surilie) are killed before this quest is started, this quest becomes permanently unavailable (using the script command stopquest, i.e., using the console to resurrect them is not enough to resume the quest). Regardless of whether you have followed the suspects or not, waiting 24 hours after having talked with Glarthir will allow you to advance the quest. Glarthir is one of the few non-essential NPC quest givers. You can avoid this quest entirely by killing him before he talks to you. You can tell the guards about Glarthir's note at any point before collecting the 1000 gold, even if you have killed all of the "conspirators". When Glarthir tells you to report to him at midnight the following day, it is possible enough time will have passed between his journey home and the chapel in order to report to him on the same day. In Glarthir's basement, you will find some notes he wrote about his thoughts on the conspiracy. These notes will update as you progress through the quest based on the choices you make. Bernadette Peneles and Davide Surilie each have an infinite amount of bread in their inventory. Since they will always eat their own bread (even if it doesn't show up in their inventory) you cannot use a poisoned apple to kill them. You can kill Toutius Sextius in his house with a poisoned apple after he is done riding his horse, but will need to make sure to pick up any food or drink item already in his house, and any food or drink items already in his inventory. If you do any of the killings for Glarthir, they will count as a murder and you will get a visit from the Dark Brotherhood the next time you sleep. Conversely, Glarthir makes an ideal candidate for the NPC chosen as the innocent murder victim to initiate the Dark Brotherhood visit. Complete his three tasks, receive the note, then inform the Surilie brothers of Glarthir's plans and intercept Glarthir before they reach him. Kill Glarthir yourself (by attacking before he can initiate conversation) and you will have qualified for an innocent murder while also dispatching an NPC who was about to be killed anyway, therefore not losing any future content or quests due. You will not receive an infamy point for killing Glarthir, and The Dark Brotherhood questline will start after you sleep. You can still kill all the spies and get your reward from Glarthir while having Gaston murder Glarthir at the same time (in order to get his house key). After killing all the spies show Gaston the note (when Glarthir is in his home). Since Gaston won't break into his house he'll just wait outside. Now fast forward to midnight and Glarthir will be moved to behind the chapel (bypassing his confrontation with Gaston). Get the money from Glarthir and he'll walk back to his house and on the way will be killed by Gaston. Now you can loot the key from Glarthir's corpse and take the 800 Septims in his house. This quest may conflict with Lost Histories due to the scripted appearance of guards. If you killed Glarthir for the quest, then kill one of the people on his hit list later, your journal will say you need to meet Glarthir at midnight to receive your reward. However, it's impossible to receive your reward given that Glarthir is dead. Bernadette Peneles and Toutius Sextius are tagged as quest items, so their bodies will never disappear should they die. Because Bernadette and Toutius are automatically added to a non-existent List of Death when you confirm them as conspirators to Glarthir, killing any of them will forward the quest to either stage 51 or 53, making Glarthir end the quest much quicker than intended. Meeting Glarthir behind the church may not trigger his correct dialogue, and he will continuously tell you he cannot speak to you in public. If this happens, reload from an older save, or PC users can advance the quest through the console. Also, make sure he's either walking to and very near his waiting spot behind the church OR is stationary and it should auto-zoom in on him and he starts talking. Usually around 2AM he starts to leave and will make the "can't talk in public" comment. 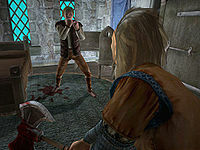 If you kill all three suspects while Glarthir is on his way to kill them himself, you will receive journal entries stating that you have killed the suspects and should meet up with Glarthir behind the chapel at midnight. If you do this discreetly without alerting any guards towards you or Glarthir, he will end up in a never-ending cycle muttering to himself that he is on his way to handle the situation himself. Even though all three suspects are already dead. It is scripted for Glarthir to deal with it because you have already spoken to Glarthir and chose not to partake in killing the suspects; though due to recent journal entries, he will still meet you at midnight behind the chapel. He offers no new dialogue and only says that he will take matters in his own hands. The only way then to complete this quest is to turn in the murder list to the guards if you still have it or kill Glarthir yourself. In the German version the Captain of the Skingrad guard is wrongly referred to as "Dionne" in the quest log (stage 8, see below). After accepting Glarthir's initial offer to spy on the people, he may subsequently be "stuck" inside the chapel from outside its cell the next time you meet him. This can be fixed by using the console command prid 000294C8, followed by moveto player. 5 I met a mysterious Wood Elf named Glarthir in Skingrad who asked me to meet him behind the Great Chapel at midnight tonight. He wouldn't tell me what it was about, but promised to make it worth my while. 8 Dion, Captain of the Skingrad guard, warned me to not get involved with Glarthir, saying that he was crazy and possibly dangerous. He also asked me to contact him if Glarthir ever asked me to do anything strange. 9 Finishes quest I met Glarthir behind the Great Chapel as he had asked. He wanted me to help uncover evidence of a conspiracy against him, but I decided not to get involved. Glarthir believes that Bernadette Peneles is following him. I need to be outside his house at 6am and see what she does. He will then meet me behind the Great Chapel at midnight to get my report. 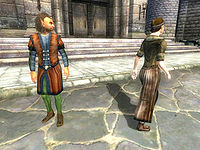 Glarthir now wants me to observe the behavior of Toutius Sextius, another suspected member of the conspiracy against him. Glarthir said that if I waited outside Toutius Sextius's house this morning, I would see Toutius following him, and then could find out who Toutius was reporting to. At midnight I am to meet Glarthir in our usual spot behind the Great Chapel and tell him what I learned. Glarthir has one final person for me to investigate. He believes that Davide Surilie is spying on his house. I should observe him for a day and then report back to Glarthir at midnight at our usual spot behind the Great Chapel. 45 Glarthir seems pleased with my efforts in investigating the people he believed were conspiring against him. He paid me well for my work. 60 I told Glarthir that I would not kill anyone for him. He took it badly, and now seems determined to take matters into his own hands. I fear he may become violent. 65 Finishes quest Glarthir has gone on a rampage in Skingrad. It seems since I wouldn't help him, he decided to kill those whom he believed were conspiring against him. 70 Finishes quest I showed Glarthir's note to a town guard, who told me they would handle the matter from here. 80 Glarthir now believes that I am part of the conspiracy against him, and is trying to kill me! I have no choice but to defend myself. 81 Finishes quest Glarthir is dead. My attempts to convince him that there was no conspiracy against him have ended in tragedy. 82 Finishes quest I have killed Glarthir. It is possible to use the console to advance through the quest by entering setstage MS38 stage, where stage is the number of the stage you wish to complete. It is not possible to un-complete (i.e. go back) quest stages. See SetStage for more information. Esta página foi modificada pela última vez à(s) 22h53min de 27 de novembro de 2015.